MY SHARONA Crowned J/111 World Champion! In the end, Gamble and his crew on MY SHARONA demonstrated yet again why they are such a good team. Never taking any flyers and trying to stay in the hunt, they managed to take a 3rd place in the first race of the last day to seal the deal and win the 2015 J/111 World Championship off Newport. They did not have to sail the last race. The weather forecast for the finale on Friday was unusual as a weak frontal system was approaching Newport offering up WSW winds in the 8-12 kts range with the expectation of afternoon showers or thundershowers. Typically, such forecasts can be way off. With skies clearing for a period of time, the Newport seabreeze machine asserted itself for a period of time fighting the frontal gradient over the land and nearshore waters. Ida Lewis YC PRO Peter Gerard setup the course east of the R4 red bell and sent the fleet off on their first race on an upwind course of 235 degrees for a 1.8nm first leg- four times around. The starts were not without a bit of drama and after several general recalls, the final start went off with an “I” and “Z” flag. Leading the fleet right after the start was Rob Ruhlman’s SPACEMAN SPIFF and after rounding the first weather mark first, they managed to maintain their lead to the finish. Second was Richard Lehman’s WIND CZAR and third was Gamble’s MY SHARONA. The final race of the series was even more complex than the first race. The impending frontal system played games with the winds and an enormous black cloud kept diminishing and reforming over the western end of the course. Winds varied from 7 to 12 kts and from 235 to 255 degrees. With an outgoing ebb tide from Narragansett Bay, it was anyone’s guess how any strategy would play out. Ultimately, it was the Brummel/ Henderson/ Mayer team on KASHMIR that rounded the windward mark first and led the fleet wire-to-wire to win race 9 in impressive fashion. Taking second was Marty Roesch’s crew on VELOCITY and third was Carl Desgagnes’ VOLTEFACE from Quebec City, Quebec. In the end, Gamble’s MY SHARONA won with a 31 pts score followed by the KASHMIR crew from Chicago YC in second place. Third was Bob Hesse’s LAKE EFFECT from Rochester, New York that normally races on Lake Ontario. Fourth was Richard Lehmann’s WIND CZAR from Harbor Springs, Michigan and fifth was Rob Ruhlman’s SPACEMAN SPIFF from Cleveland, Ohio. There’s no question there was a bit of a “theme” here, many of the top J/111 teams were all Midwest/ Great Lakes boats from J/111 Fleet #1 in Chicago and the surrounding area. Thanks to the Ida Lewis Yacht Club, Commodore Gary Lash, Event Chair Pat Connerney, PRO Peter Gerard and their amazing team of volunteers that helped make the J/111 World Championship a resounding success. Finally, thanks go out to all the sponsors that helped support the event, including Gold Sponsors North Sails and B&G electronics and also Industry Sponsors that included Bacardi, J/Boats, MJM Yachts, SEABlade, Quantum Sails, V Sport and RaceQs.com. Sailing photo credits- Cate Brown. (Newport, RI)- The weather forecast for Thursday’s racing was benign enough- winds of 6-9 kts from the SSW all day with skies clearing in the afternoon. After about an hour postponement, the seabreeze filled in from the classic southerly direction offshore. Once the winds averaged 5 kts, Ida Lewis YC PRO Peter Garard sent off the fleet on the first of three windward-leeward races. By the late afternoon, the breeze had built into the 8-12 kts TWS range, making for excellent, incredibly tightly-packed racing. Sailing the best record of the day was none other than George Gamble’s MY SHARONA, extending their lead with a 4-3-1 scoreline for a total of 19 pts overall and a seemingly unassailable 15 point lead over the rest of the fleet. Behind them, it has become a war of attrition for many teams hoping to crack the top five overall. By virtue of their 3-4-20 finishes, Bob Hesse’s LAKE EFFECT has now taken over second overall with 34 pts. However, only one point back is David & Maryellen Tortorello’s PARTNERSHIP; their first race horizon job drove them into contention with a 1-7-11 score for the day (photo above). Sitting in fourth is the trio of Brummel/ Henderson/ Mayer on KASHMIR, posting the second best scores for the day with a 5-6-3 for a total score of 39 pts. After being in striking distance for the lead after the first two days, Rob Ruhlman’s SPACEMAN SPIFF had a rough go of it on Rhode Island Sound with a 19-10-5 scoreline to drop into fifth overall with 40 pts total. Only ten points separates 5th from 10th place in this close-quarters racing. You can search the Gallery of Cate Brown photos here. You can search by Bow number, Sail number and Boat name to filter through all the images. (Newport, RI)- After a challenging first day of sailing offshore, the twenty-five teams sailing the J/111 Worlds were treated to a “Newport Chamber of Commerce” day for their second day on the race track. Starting off with the captain’s meeting at 9am Wednesday morning, the Ida Lewis YC PRO Peter Garard announced to the fleet that it was going to be an “inside the Bay Day” and to be prepared to sail two races, a first race windward-leeward followed by the long distance race “Bay Tour”. The morning dawned with a gorgeous sunrise, winds howling out of the north at 20-30 kts. The forecast was for winds to ultimately diminish into the 10-18 kts range by the start at 11am from 30-40 degrees and veer to the east, in an oscillating-persistent shift to 90 degrees or so by late afternoon. As it turned out, the forecast was not far off and it made for a spectacular day of sailing on Narragansett Bay. The starting area for the first race was immediately west of the northern end of Gould Island and the famous “US Navy torpedo range” buildings. Fast off the start was Chris Jones’ WILD CHILD, nailing the starboard end start and covering the fleet going off on starboard tack. One of the first boats to flip onto port tack was Rob Ruhlman’s SPACEMAN SPIFF. Ultimately, it was the right move as they led the fleet off to the right hand corner of the first weather leg to lead the fleet around the first mark and win the race. Second was George Gamble’s MY SHARONA and third was Bob Hesse’s LAKE EFFECT. The second race was the Navigator’s Long Distance Race. The fleet was given a long 3.5nm windward leg to the green gong in the straits formed by the southern end of Prudence Island and Dyer Island on the northeastern part of the Bay. This was followed by a reach to the red bell of the NE corner of Jamestown (Conanicut Island), then a spinnaker reach, then a fetch east across the Bay, then a long run down to the green Clingstone Rock bell and to the finish off Fort Adams. The race was such that the first beat determined the pecking order for most of the fleet. It also meant choosing which side of the Bay to hit a corner, go left up along Conanicut Island and play shifts into the green buoy or go right to the Portsmouth shoreline for current relief and perhaps large right hand shifts off the shore. Off the start, the British team on WILD CHILD skippered by Chris Jones again nailed the RC committee boat start and took off to the right leading the fleet. Another pack of boats started towards the left end of the line (including Gamble’s MY SHARONA, Ruhlman’s SPACEMAN SPIFF, Bob Hesse’s LAKE EFFECT and David & Maryellen Tortorello’s PARTNERSHIP) and played a completely different wind/current strategy to the far left hand side of the race course. At the first windward mark, that pack remarkably led the fleet around the first mark. First in from the right hand side grouping was Jones’ WILD CHILD. From there on end it was essentially a parade around the marks to the finish line. Gamble’s MY SHARONA won the last race and is now leading the J/111 Worlds with a 9-8-2-1 for 20 pts and the only boat with all single digit finishes. Taking 5th in that race and now lying second overall is Ruhlman’s SPACEMAN SPIFF with an 18-1-1-5 tally for 25 pts. By virtue of their second in the last race, Hesse’s LAKE EFFECT is now third overall with a 10-12-3-2 for 27 pts. Jumping into 4th overall is the Tortorello’s PARTNERSHIP with a 3-10-10-4 for 27 pts and in 5th is Martin Dent’s JELVIS with a 1-6-14-7 for 28 pts. (Newport, RI)- With twenty-five boats on the line, it was anyone’s guess what would happen when you mixed the current J/111 World Champion and leading UK teams lined up against the top American, Canadian, Australian and Caribbean teams from across the world. The weather forecast was not promising. An overcast day with a dying northerly that was supposed to see a gradient/ seabreeze combination develop in the middle of the day into the 6-10 kts range with the breeze filling in at 200 degrees and veering to the 230 range. As it turned out, it was not that far off. After a postponement, the Ida Lewis YC PRO Peter Garard fired off the first race in a 6-9 kts breeze in the 210 range. By the time the second race took place at 1600 hrs, the wind had veered further right into the 220 to 240 deg range and from 9 to 12 kts TWS. Leading after the first day is the British team of Martin Dent sailing JELVIS from Cowes, Isle of Wight with a 1-6 tally for 7 pts total. Second is Richard Lehmann’s crew on WIND CZAR with an 8-3 scoreline for 11 pts (the current J/111 North American champion). And, third is David & Maryellen Tortorello’s PARTNERSHIP with a 3-10 score for 13 pts. So close is the racing that an average of a 10th is good enough to place your team in the top ten. Even more remarkably, only ten points (well within a mid-fleet finish) separates teams from 3rd place to 15th place! It’s quite possibly the tightest regatta that anyone has seen ever amongst the top teams after the first day of racing. As Rob Ruhlman mentions in his interview, “its far too early to tell who are the prime competitors.” And, this is after just two races. Wednesday promises to be a defining day for the fleet overall, with up to three races planned for the fleet. With so many teams so closely packed, it’s anyone’s guess what the leaderboard looks like after Wednesday’s racing. The weather forecast is promising- moderate northeast winds in the morning, veering and diminishing to 5-10 kts by evening under brilliant, sunny skies. (Newport, RI)- In just four short years, the J/111 class has grown at a remarkable pace. 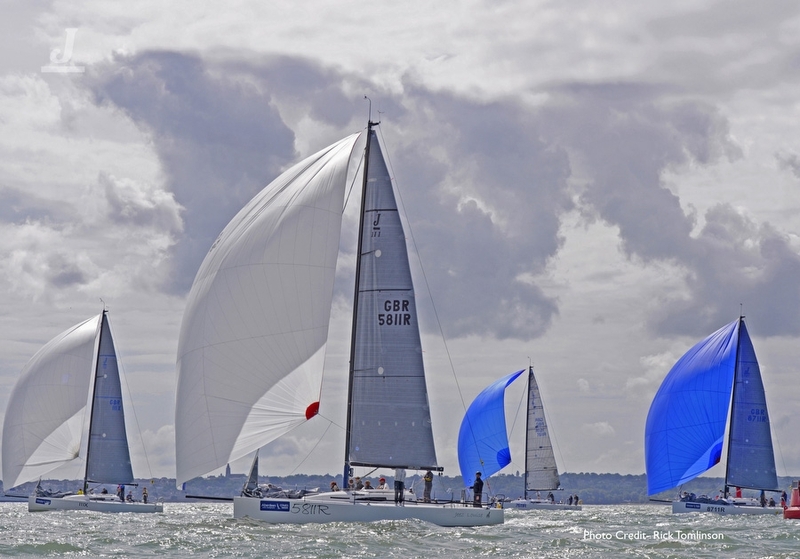 It achieved International Class status from ISAF in less than two years and hosted its first World Championship in Cowes, England in 2014 with thirteen boats in attendance, hosted by the Royal Yacht Squadron. Today, over 115 boats have been launched since the fall of 2010 and nearly 25% of that fleet is showing up for the J/111 Worlds in Newport for the week of June 15th to 19th. The twenty-five boats entered come from the British Virgin Islands, Australia, Canada, Great Britain and the USA. Of the American boats, teams have traveled from as far west as San Diego, California, representing a total of twelve states (including Illinois, Wisconsin, New York, Maryland, Connecticut, Florida, Michigan, Rhode Island, Ohio, Massachusetts and Arizona). The excitement is building amongst the crews in anticipation of sailing in the beautiful waters off Rhode Island. Newport is famous worldwide for hosting such events as the America’s Cup, numerous one-design class world championships and, most recently, the Volvo Ocean Race. Hosts for the 2015 event are Ida Lewis Yacht Club and partners Sail Newport. The fleet will be based at the Volvo Ocean Race Piers and the Alofsin docks at Fort Adams State Park. Looking forward to that opportunity of racing off Newport is the current J/111 World Champion, Duncan McDonald and Phil Thomas from Great Britain. This sharp duo shipped their boat- SHMOKIN JOE- over from the U.K. to participate; she has been seen for some weeks up at NEB Boatworks in Portsmouth, RI and she’s looking mighty fast and clean as a whistle. Other top five J/111 teams from the U.K. include Chris Jones and Louise Makin of JOURNEYMAKER V fame sailing a chartered boat- WILD CHILD; Tony Mack’s notoriously fast crew aboard Team McFLY from Royal Southern YC; and Martin Dent’s JELVIS team of young, fast and smart dinghy sailors from Queen Mary Sailing Club. Virtually all of the top American teams will be in attendance from the Midwest (Chicago-Mackinac Race winners and J/111 North American winners), the Gulf Coast (Key West Race Week winners) and the East Coast (New York YC Regatta, NOOD Regatta, Edgartown Regatta and Block Island Race Week winners). Current J/111 North American Champion, Richard Lehmann, will have his WIND CZAR crew from Little Traverse YC ready to show their performance in the Midwest was no fluke. They will be accompanied by the balance of the top five from the last NA’s on Lake Michigan: Dave Irish’s NO SURPRISE, the Chicago trio on KASHMIR (Brummel/ Henderson/ Mayer), Rob Ruhlman’s SPACEMAN SPIFF, and Marty Roesch’s VELOCITY. The top eastern teams include Doug Curtiss’ WICKED 2.0 from Buzzards Bay; David & Maryellen Tortorello’s PARTNERSHIP from Long Island Sound; and Fred Van Liew & David Brodsky’s ODYSSEY from Newport, RI. Participating from Sydney, Australia is Rod Warren and Ray Entwistle on LIBERTAS (partnered with owner John Donovan) and, from north of the border comes two Canadian teams from Quebec: Marcel Cote’s SURVENANT and Carl Desgagnes’ VOLTEFACE, both from Quebec Yacht Club. The long-term forecast appears promising with a broad variety of wind and weather conditions to challenge the fleet on Rhode Island Sound. In the forecast are for at least one weather front to pass through with breezes ranging from the classic southerly seabreezes (200-240 degrees) with 10-20 kt winds and frontal passages leaving lighter NW to NE breezes in the 5-10 kts range and flatter waters. The fleet will be sailing mostly windward-leeward courses, but one day will also include a middle distance race of around 18-25 nm depending on breeze. Helping the visiting teams on “local knowledge” will be none other than North Sails President Ken Read. Having won six J/24 World Championships (including one in Newport), Ken should be able to provide teams with a perspective on what it takes to get around the track offshore in Rhode Island Sound. Ken’s local knowledge chat will take place on Monday, June 15th at 5pm at Ida Lewis YC. As a primary sponsor, North Sails is also providing “North Sails Day” on Tuesday, with a review of the day’s racing by North U Regatta Services (Chuck Allen and Sandy McMillan) under the Sail Newport tent. In addition, the J/111 Worlds’ organizers welcome aboard Gold Sponsor B&G, the navigation electronics equipment of choice for most of the top J/111 teams. Furthermore, the organizers welcome Industry Sponsors BACARDI (supplying the official cocktail- the “Cuban Storm”), MJM Yachts (supplying the official VIP yacht), SeaBlade (the official mark/ support boat from NEB Boatworks), Quantum Sails (the supplier of gear for all registered boats) and RACEQS.com (the official live tracking/ replay supplier). Sailing photo credits- Rick Tomlinson. Bacardi has been supporting J/ classes since the first J/24 Midwinters in Key West in 1978. To help kick off their summer season in Newport (Bacardi Newport Sailing Week is June 26-28), Bacardi will be serving up Cuban Storms (Bacardi 8 and Ginger Beer) during several of the J/111 Worlds parties. Running successful events takes both a lot of volunteer effort AND corporate support. We’re pleased to thank several companies who are generously supporting the J/111 Worlds. B&G Instruments is a Gold level sponsor who will be hosting one of the after-race parties and will be on hand to support all the teams with any instrument needs. North Sails is a Gold sponsor who will be hosting a party and bringing their Regatta Services team to support the event with a local knowledge talk and video recap of the first two days of racing. MJM Yachts and Navatek (Seablade) are providing the VIP and photo boats. Quantum Sails is providing special embroidered skipper bags. Our friends at RaceQs.com are providing the J/111 Worlds with free race-tracking and replay capability for the entire fleet. You don't need any special equipment to get started, just a smart phone with the FREE RaceQs application downloaded onto your Apple or Android phone. Keep track of your practice sessions as well as the racing (replays shown here). J/Boats sponsored the development of the J/111 avatar, so the 3D animation looks as close to the real thing as possible. Please click here for more RaceQs.com information and the App download. (Newport, Rhode Island)- Gracing the waters in her classic Downeast style, the extraordinary MJM 50z ZING from MJM Yachts will be the Official Yacht and V.I.P. Boat for the 2015 J/111 World Championship. The 50z is the ultimate spectator boat with 360 degree visibility, Seakeeper Gyrostabilized comfort and Volvo Penta DPS automatic hovering system. Created, designed and built by sailors, it's an honor to "Welcome" MJM Yachts aboard as a sponsor of the J/111 World Championships. For more information please see MJMYachts.com or contact Bob J. at "mjmyachts@verizon.net"